Discover all the must-see sights of Morocco in this incredible 9-day journey that takes you from north to south. 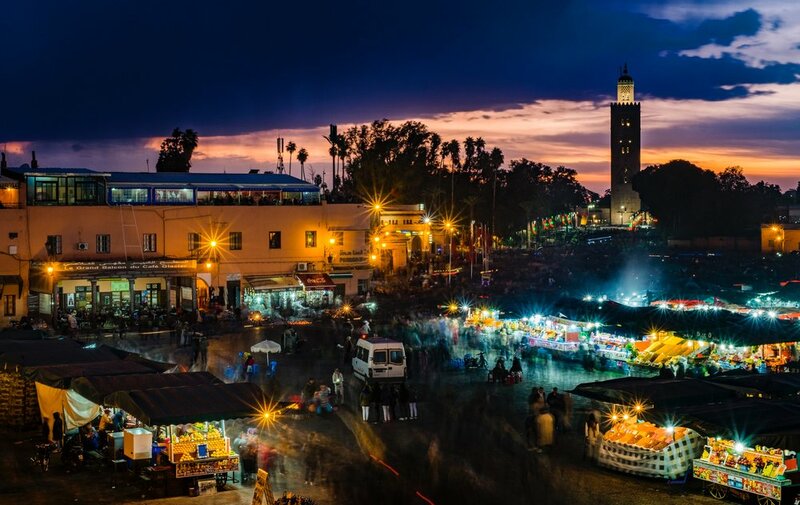 See the famous blue city, tour the ancient Fes medina, spend a night in a luxury Sahara camp, and so much more. Get ready for the adventure of a lifetime! Meet your driver at the Casablanca airport in the morning. Visit the beautiful Hassan II Mosque, perched on the edge of the Atlantic Ocean. Continue on to Chefchaouen, nestled high in the Rif Mountains. Overnight in Chefchaouen. Spend the day exploring the charming blue-washed medina. In the afternoon, travel south to Fes. Overnight in Fes. Take a guided tour of Fes, visiting the Royal Palace, strolling through the mellah, and touring the old medina, stopping at artisan workshops such as the silk weavers and the famous Fes tannery. Overnight in Fes. Depart Fes to travel south to the Sahara Desert. Make stops to visit the wild monkeys outside of Azrou and to take in the stunning scenery as you cross the Atlas Mountains. Arrive in Merzouga in time to take a quad excursion into the Sahara to watch the sunset from the top of a dune. Dinner at your riad. Overnight in Merzouga. Take an excursion through the desert in the SUV, riding up the red dunes, visiting the Gnawa village with its entrancing music, and enjoying lunch in the Sahara. In the late afternoon, meet your camels for a trek into the luxury camp. Enjoy live music around the bonfire after dinner. Overnight in the Sahara. Depart camp and begin your journey west. Visit the Dades Gorges, and hike through the Rose Valley in Boumalne. Dinner at your riad. Overnight in Boumalne. Complete your journey to Marrakech, stopping at Ait Benhaddou in Ouarzazate and crossing the Atlas Mountains once more via Tichka Pass. Arrive in Marrakech in the afternoon and check into your hotel near the Jemaa el Fna square. Overnight in Marrakech. Free day to explore Marrakech. Wander the souks, enjoy a traditional hammam, visit museums, or just explore the city. Overnight in Marrakech.